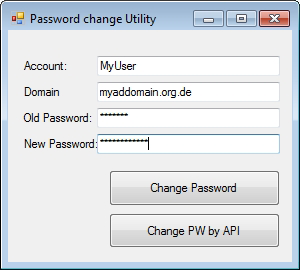 in Active Directory Domain environment you have to frequently change your password. The default Windows methods usually does not support clipboard operations. So you have to enter your new password two times and depending on your method your old password too 🙁 . I wrote a small tool to change a password. It supports two approaches. A problem of method 1 is that if the password is already expired and you try to change the password an error occurs. Method 2 can change the password even it is already expired and the PC is not member of an different domain or workgroup. C# Source code is available. You can also find a precompiled binaries ADPasswortChange.exe in the \bin\debug or \bin\folder release, so you do have not to install Visual Studio.